Our subject for this edition of Fighters of New York, Katlyn Chookagian, aka “Blondefighter,” sits on top of a transparent desk on the second floor of the Renzo Gracie Academy, located in Midtown Manhattan. Her training gear is downstairs, next to the jiujitsu mats. She is smiling and friendly, but focused on what she is saying. Currently training out of AllStar BJJ and Ricardo Almedia’s academy, both Renzo Gracie affiliated academies located in New Jersey, Chookagian doesn’t train just to win fights–she trains to be the very best. Her martial arts journey began at four years old when she started taking a hybrid of Karate and Tae Kwon Do classes. Even then, she was dedicated and went to practice every day. She began boxing and kickboxing in high school, and eventually competed in boxing in Golden Gloves. No-gi Brazilian Jiu Jitsu classes became a part of her routine in college and more so after she graduated. After years of striking practice, Chookagian took some time to focus solely on her Jiu Jitsu, training twice a day every day. She found Jamal Patterson, her mentor and guide, for her next adventure: an MMA career. Since Chookagian started those karate classes so many years ago, she knew she wanted to be a fighter. Martial arts is something she knows will stay with her for her entire life. “I will probably be training Jiu Jitsu when I am a grandma,” she says with a grin. Chookagian is driven to achieve her goals. Her record speaks for itself: 14 back to back fights, all undefeated. 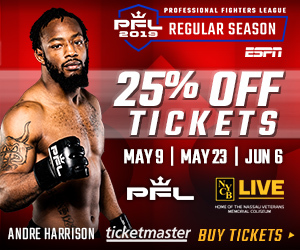 7 amateur fights, 7 professional, all ending the same–with “Blondefighter” as the winner. “Blondefighter” puts herself through a lot. What is most important to her is to compete. She trains constantly, and fights much more than the average competitor. In the last year alone, she’s competed five different times. Even when she was an amateur fighter she was training at a pro level. Now all that needs to be done is for an organization such as the UFC or Bellator to take notice and sign her. 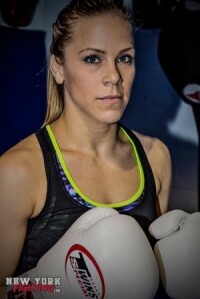 Chookagian is one of the top prospects at Flyweight. Her years of experience, spectacular performances, great finishes, and growing following put “Blondefighter” as one of the main fighters people want to see. These leagues, however, do not currently have many options for women. The UFC only has Strawweight and Bantamweight, while Bellator maintains a Featherweight and, now, Flyweight. “I’d prefer to compete at 125 lbs., because that is where I’m most comfortable, but I’m open to different options.” However, with Bellator recently opening a Flyweight division, Chookagian’s fans are hoping that she’ll be signed to the league. Her teammates know that she works hard and will only advance the sport even further with her performances. “Blondefighter” sees training as a lifestyle. “I constantly want to fight, but in between fight camps is when you really get to develop your skills. I learn so much from my teammates and my camp. 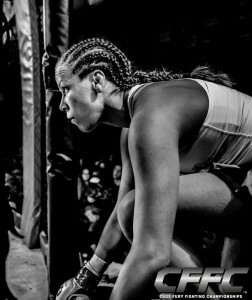 Jamal Patterson and Mark Henry have really put so much time and effort into me, that listening to exactly what they want and doing exactly what they want is the best way I can show my appreciation for them.” She trusts her corner with everything, and credits them for the team’s great conditioning and footwork. Everything that they are doing with her is working well, and Katlyn is only getting even better with every training session.